This might be my girliest post ever! It is about backpacking with makeup in a carry-on bag. While I was trying to travel Peru and Bolivia with a carry-on only bag, I only wanted to travel with minimal makeup. I brought some BB Cream (a mixture of moisturizer, SPF, and light foundation), mascara, black eyeliner, and a neutral eye shadow palette. That’s it! It boils down to the fact that while I was proud of myself for going so minimal with the makeup, I wasn’t really happy with it. Most of the time I just used my fingers to apply the BB Cream and I put on a bit of mascara. I hate putting on eye shadow without brushes and that fact combined with just getting tired of the same brown colors made me not want to use them. I am too pale to forgo blush! I also wanted a little more variety and sparkle to my eye shadow (NYE without sparkle was sad, haha). Another problem is that while my eye shadow palette of four colors was lightweight, it did NOT have a mirror. 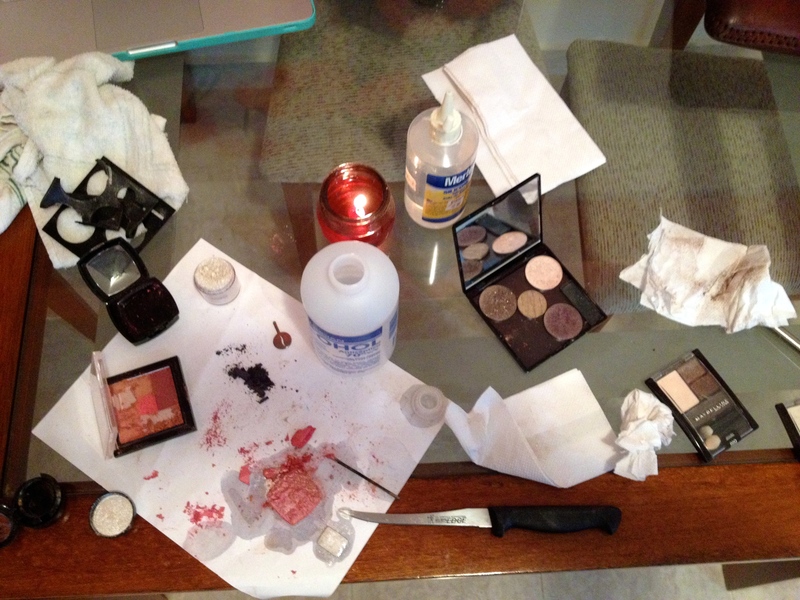 Doing your makeup while sharing a dorm room with six other girls with only one mirror in the attached bathroom. The “hotels” in Uyuni only had one mirror for the whole place so 20 people were sharing it with me. Even sharing a dorm room with three other girls and one mirror is difficult. I needed a mirror! So how can I bring everything I want, and still be lightweight? I turned to YouTube and typed, “make your own makeup palette”! Most of the videos showed people making palettes from DVD cases or CD cases…neither of which I have ever seen in Venezuela because the only ones I see are copies. Instead of using either of those solutions I went on a search around my apartment only to find a cute little palette of three colors I got from Sephora. It also had a mirror. I remember originally buying it because it was magnetic so I could change out the three colors at any time. Then I realized that instead of holding only three colors I could deconstruct it and fit in a blush and three other eye shadows! While “depotting” my blush I accidentally gouged out a chunk, which inspired me to add a little highlighter and bronzer to it using 70% alcohol. 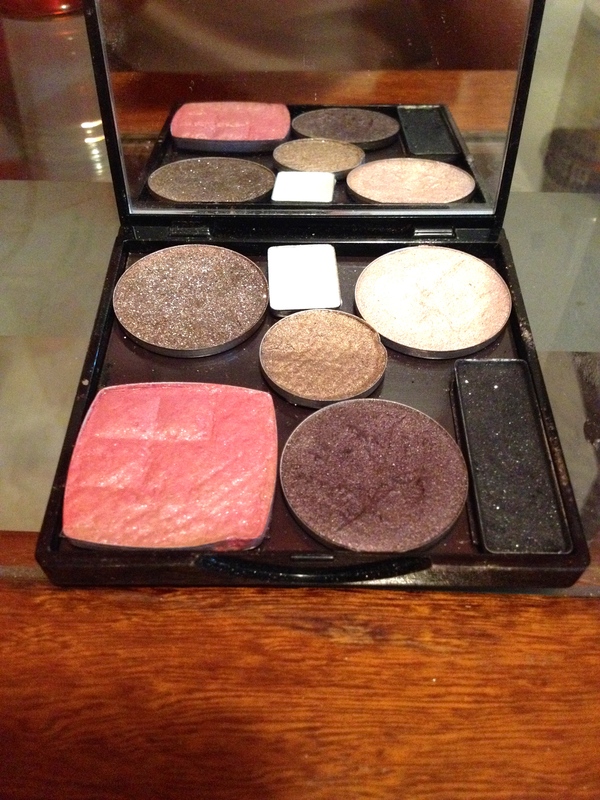 Then, using a candle to melt the glue, I easily popped out my black and goldish eye shadows to add to my new palette. Using the same candle method I removed another pan and I scraped out an eye shadow I hardly used and pressed some pigment into it. Finally, I stuck on some magnetic tape I had lying around (I brought it from the states because as I teacher, I love magnetic stuff!). To solve the brush problem, I will simply bring one eye shadow and one blush brush! Now I have a palette of six colors that I love which are still neutral, yet can still be dolled up for a night out. I also have a new blush/light bronzer combo in the palette. AND it has a mirror! My final product! 6 eyeshadows, one blush AND a mirror! Thanks! Just trying to save space and time. I like to think that I am this tough adventuress who doesn’t need makeup, but if I am going to these picturesque locations I will want to be in some photos too and I want to look my best for them! I will save my no makeup days for camping trips with family. I’m on the lookout for a small brush that I can somehow wedge into my palette! Otherwise, I will sacrifice some extra space and bring at least one or two brushes. haha. I mainly didn’t want to carry around the separate blush, and three eyeshadow containers that these all came from. It is nice only having to fit the one palette into my bag!